Made-to-measure sales are thriving online, whether it’s for shirts or suits. But many of the most successful players in that sector have discovered that the once-heralded “online-only” model just won’t cut it anymore. It seems that in addition to picking fabric, lapel shapes, and linings, guys also want to choose whether their shopping experience is tactile or purely technical. Even online retail giant Amazon announced in April that it too would be joining the custom-made clothing pack through its newly patented “on demand” apparel manufacturing system that will be able to produce items in personalized fits and other specs in just five days. Meanwhile, smaller players also continue to enter the fold For example, Crisp, a new custom shirt line that employs 3-D measurements and the customer’s height and weight, for the “perfect fit”, recently launched its Kickstarter campaign and plans to start shipments by October. But as both the players and the playing field are expanding, early innovators such as Indochino, which was founded a decade ago, and Knot Standard, which turns seven this year, have recently been taking steps “backwards” and putting as much emphasis on their brick-and-mortar showrooms/locations as they are on their virtual ones – even though their business models were initially conceived as online only. The granddaddy of online made-to-measure companies, Vancouver-based Indochino pioneered the concept of selling perfectly fitting suiting on the internet and via in-person showrooms where clients are measured and can see, feel and select fabrics and other options such as collar felts and linings. Now in the midst of expanding its physical footprint, it will operate 17 of these in-person destinations in major cities in the U.S. and Canada by August 2017. 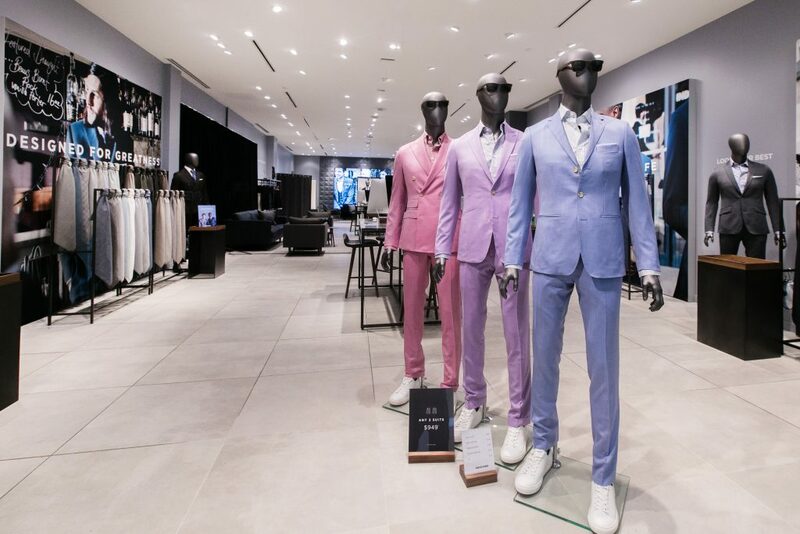 Its wide customizable offer includes suits (from casual models to tuxedos), and shirts and it also sells ready-made accessories such as neckties, pocket squares and cufflinks. At-home measurements take less than 10 minutes, orders are shipped in four weeks and the company will reimburse clients for up to $75 should their purchase need additional adjustments by their local tailor. The company received a $30 million strategic investment from China’s Dayang Group last year and CEO Drew Green has said that it intends to sell one million suits per year by 2020. Founded in 2010 by Matt Mueller and John Ballay, Knot Standard now operates seven freestanding showrooms in major U.S. cities, one more in Dubai and has a shop-in-shop at the Bloomingdale’s flagship in New York. Stantt, which takes its mashed-up name from “constant improvement,” began in 2013 as a direct-to-consumer online brand that offered 75 different sizes of shirts based on customers’ chest, waist and sleeve measurements. Produced in the Honduras and retailing in four tiers from $98 to $225, the shirts take a week to arrive. While its online business is still healthy, the label has now delved into wholesale. Stantt is currently carried by about 50 specialty retailers across the country, half of whom market this custom shirt offering under their own store’s name instead of the Stantt one. “We adopted a hybrid online/retail model. About half of our business is online and half in retail. We believe brands have to have a little bit of both to be successful,” says Keel. So a word to the wise, Jeff Bezos: You’ll probably want to add some bricks to your new clickable made-to-measure venture and be like the following brands, which are thriving with personalized offerings that they are hawking both in cyberspace and the conventional marketplace.